Turrón Jijona and Turron de Alicante PGI: a Mediterranean diet product made with natural ingredients and artisan production. Turrón is a clear example of the Spanish gastronomic inheritance from Arab cuisine. ​The honey, sugar, almonds, hazelnuts, walnuts and pistachios which the Moors used in large amounts in their pastries continue to be the basic ingredients. Turrón and marzipan are the most typical Christmas confections in Spain, a gastronomic tradition that has persisted for over five centuries, as shown by historical documents recording turrón production in the town of Jijona (Alicante, Valencian Community) in the 16th century. 100% handmade, premium quality, no additives, no preservatives and vacuum packed, elaborated by Casa Mira since 1842. A soft confectionery made by cooking sugar and honey, adding and kneading in roasted almonds and egg white. The Jijona turrón is soft, textured and creamy. Sweet, with a slight retronasal touch of herbs such as rosemary and thyme coming from the honey, and a slightly smoky, warm taste of noble wood, from the roasting of the almonds. On the nose, the rounded aroma is reminiscent of spice and herbs, such as ginger and cardamom. When chewed, the mixture is smooth and velvety, reminiscent of peach skin. The use of almonds means that these varieties of nougat are high in calories, low in water content and a good source of carbohydrates, fibre, fats, phosphorus, magnesium, calcium and vitamin E. The fat they contain is principally unsaturated due to almonds being the principal ingredient and, as a result, they are low in cholesterol. 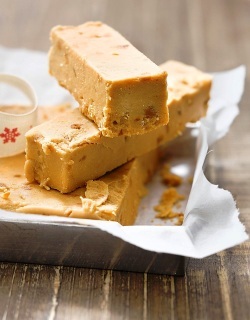 Turrón, a hard confectionery obtained from cooking sugar and honey and adding roasted Marcona almonds and egg white. 100% handmade, premium quality, no additives, no preservativas and vacuum packed, elaborated by Casa Mira since 1842. 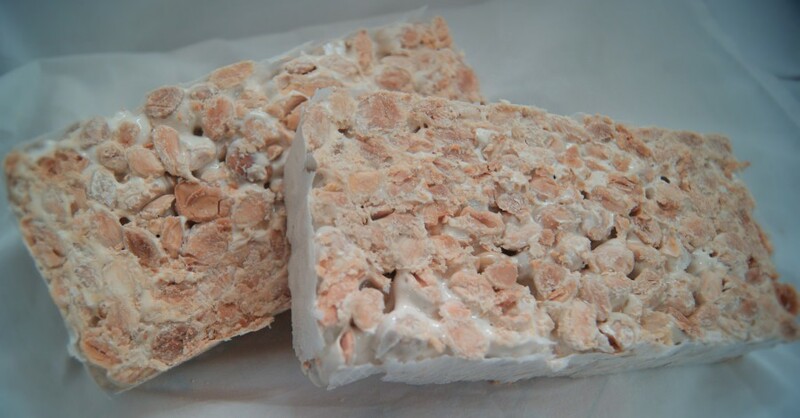 Premium quality crunchy Nougat with almonds and honey. Torta made with Turron de Alicante PGI. Alicante turrón is dryer, harder and covered with a smooth wafer. Their basic ingredients are peeled and toasted almonds, honey, egg whites and sugar. The use of almonds means that these varieties of nougat are high in calories, low in water content and a good source of carbohydrates, fibre, fats, phosphorus, magnesium, calcium and vitamin E. The fat they contain is principally unsaturated due to almonds being the principal ingredient and, as a result, they are low in cholesterol. ​The key to making authentic Alicante-style turrón lies in the selection of the raw materials, as well as in the cooking and the mixture of sugar and honey, which is referred to as molasses. However, the master nougat makers are very secretive about the real key to making this sweet into a supreme desert: el punto de la bola (the moment it can be rolled into a ball). 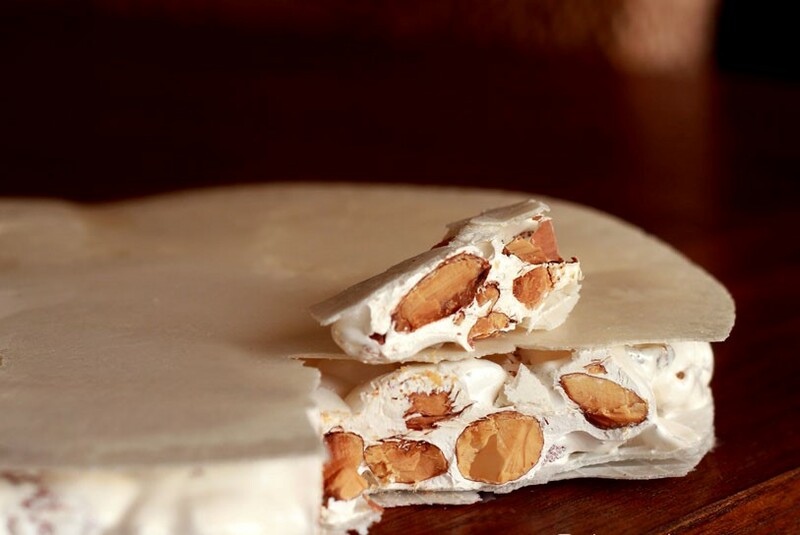 In other words, the exact moment when the mixture of all the ingredients converts an ordinary nougat into one from Jijona and Alicante. A round, hard turron (Spanish nougat) with a whole layer of roasted almonds bound together with honey, sugar and egg white and encased in rice paper. An artisan turron handmade by Casa Mira from highest grade Marcona almonds. A traditional Christmas sweet in Spain which is delicious with a glass of Moscatel.